WEST PALM BEACH, Fla. -- People are going out on a limb to make a statement about beautification on Clematis Street in downtown West Palm Beach. And it's turned into a unique and fun display of public disobedience. "Someone has to 'bark' at them," said Jim Kovalsky, who has spoken out about empty tree pits on Clematis Street and Dixie Highway. "The rest of the planters along this section all have trees." But these particular plots across the street from city hall do not have trees and have been this way for at least a year, according to downtown residents. “It's basically become a tripping hazard with no tree in them when we're trying to have walkability," said Kovalsky. And that's why a 'vegetation vigilante' decided to plant some trees themselves. It's unknown who put the trees there. Kovalsky and his friends added to the fun, by decorating it like the Charlie Brown Christmas tree. "Bring some attention in a different way," he said. "It kind of just branched out from there." The trees started a buzz on social media. "And very quickly after that, both trees unceremoniously disappeared," said Kovalsky. And then, in place of the trees -- a graveyard appeared. 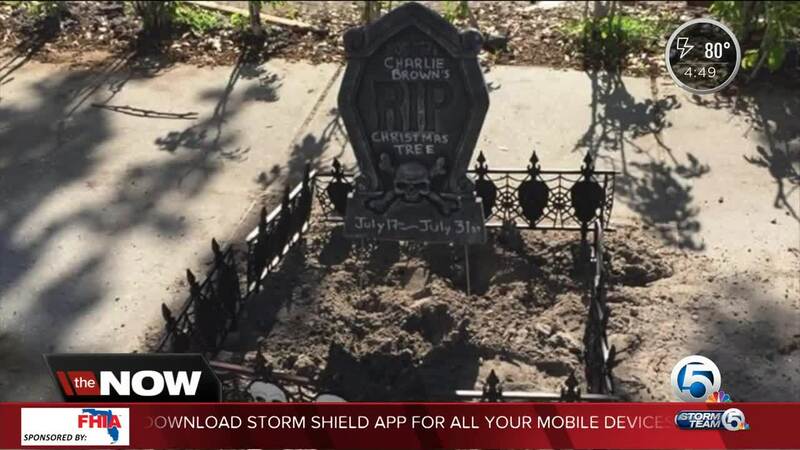 "It said "RIP Charlie Brown Christmas tree. I have no idea who put that there," chuckled Kovalsky. Here's some good news -- Mayor Jeri Muoio has identified a million dollars to increase tree benefits throughout the city. According to the city, the focus of this dedication is to support of West Palm Beach Net Zero Green House Gas Emissions by 2050 Initiative and to improve the walkability and bikeability of the downtown space and connectors by increasing shade. To do this, West Palm beach is concentrating on planting 20 ft. shade trees throughout the community, using native Florida trees and selecting a wide variety of acceptable shade tree species. Howard Park will be receiving 10 new trees in the coming weeks. Working with Florida Power and Light, the City of West Palm Beach is planting the trees to complement the solar tree structures which were recently installed. That project will be completed by late August or early September. Additionally, empty tree pits have been marked and the individual needs of each location are being assessed to improve the longevity of the trees planted in the downtown. The 300 Block Clematis Street project is adding suspended paver systems for those tree planting locations. According to the city newsletter, "this type of system physically increases available pore space and creates greater opportunity for soil aeration and uptake of nutrients and moisture, which all contribute to increased tree health. One study has illustrated that trees planted in a suspended paver system can grow more than 3 ft. taller over a six-year period in comparison to trees planted in conventional soil. Additionally, structural soil, a mixture of crushed gravel and soil which decreases overall soil compaction, is also being used in downtown locations and is expected to enhance tree growth and longevity." At least for now, downtowners are trying to take the edge off an otherwise touchy subject. "Humor is a great way to get through to people," said Kovalsky. "A lot of small pieces that can be done easily, that gets us in the right direction."